'The Lord is my shepherd, I shall not want.' 'Thy word is a lamp to my feet.' 'Search me, O God, and know my heart!' Such phrases leap to mind each time a Christian lifts his heart to God. For many, in fact, the Psalms are the richest part of the Old Testament. 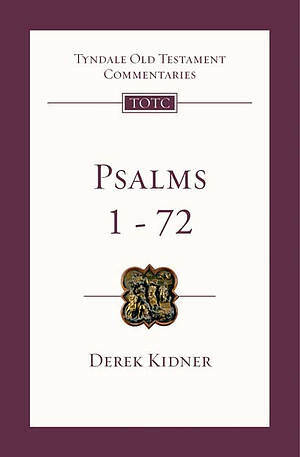 Derek Kidner provides a fresh and penetrating guide to Psalms 1 - 72. He analyses each psalm in depth, comments on interpretative questions and brings out the universal relevance of the texts. He also gives special help on the psalmists' cries for vengeance. Together with its companion volume (Psalms 73 - 150) this introduction and commentary will inspire and deepen personal worship. Psalms 1 72 : Tyndale Bible Old Testament Commentary by Derek Kidner was published by Intervarsity Press in January 2009 and is our 13699th best seller. The ISBN for Psalms 1 72 : Tyndale Bible Old Testament Commentary is 9781844742929. Be the first to review Psalms 1 72 : Tyndale Bible Old Testament Commentary ! Got a question? No problem! Just click here to ask us about Psalms 1 72 : Tyndale Bible Old Testament Commentary .